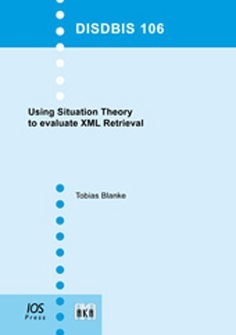 This book presents a theoretical framework to evaluate XML retrieval using Situation Theory. XML retrieval deals with retrieving those document components, the XML elements, that specifically answer a query. Theoretical evaluation is concerned with the formal representation of qualitative properties of retrieval models. It complements experimental methods by showing the properties of the underlying reasoning assumptions that decide when a document is about a query. We define a theoretical methodology based on the idea of ‘aboutness’ and Situation Theory and apply it to current XML retrieval models. This allows comparing and analyzing the reasoning behaviour of XML retrieval models. For each model we derive functional and qualitative properties that qualify its formal behaviour. We then use these properties to explain experimental results. We further analyse specific characteristics of XML retrieval such as the attempt to only retrieval the most focussed answers as well as specific evaluation criteria.